Full Description: From the Ruth Askew Collection. 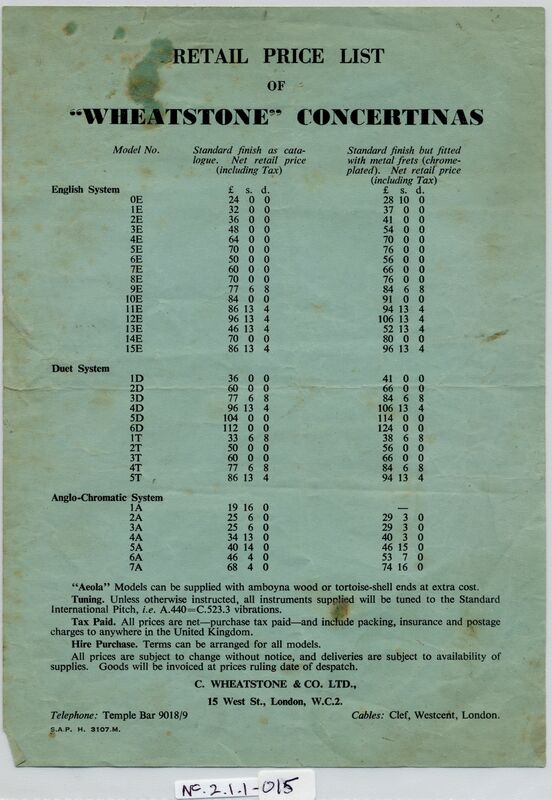 An undated Retail Price List for Wheatstone concertinas, from the West Street address. Its print code is S.A.P H. 3107. M., and the phone number ("Temple Bar 9018/9") and Cable address ("Clef, Westcent, London") are present, indicating a late, probably post-war publication. It lists 17 English models, (0E to 15E); 11 Duet models (1D to 5T); and 7 Anglo-Chromatic models. "Standard finish" instruments range in price from £19-16-0 to £112-0-0.